- Support for iPhone 6 & 6-Plus. By the way, a few app users have posted negative reviews because of the app crashing. Sales Goal Tracker Pro works great. But nothings perfect. If the app crashes/closes on opening, 99.7% of the time something has gone wrong installing. No idea what, it just happens. EASY FIX: Simply delete the app and reinstall and it almost always works great. And, today only, it’s FREE, and being featured in AppsGoneFree, Your daily free app resource. There is now one supreme sales goal tracking app in the history of apps. In fact, even though many corporations insist on their sales team using Salesforce, ACT!, ZohoCRM, MicrosoftCRM, SugarCRM or other CRM’s, the power and influence of Sales Goal Tracker Pro for personal sales goal tracking goes unquestioned. It is now, the choice sales tool of successful sales pros — the clear choice whenever quick and accurate sales goal setting and tracking is wanted and needed. —> Mary Poul, Publisher, Sales Mastery Magazine says, "It just works. Period. It’s absolutely amazing." —> It’s featured in: Realtor Mag, Life Insurance Selling, Top Apps Today, Alltop, App Picker, Life Health Pro, Producers Web, App Advice, Home Business Magazine, “CNN News: Product Of The Week” and many more. ● Calculates and displays what you earn from each sales activity. ● Included hundreds of motivational tips, quotes & sales secrets. Imagine leapfrogging ahead of the competition. Getting more praise … more commissions … a fatter bonus and sales awards. And your competitors are left wondering – HOW DOES HE/SHE DO IT? 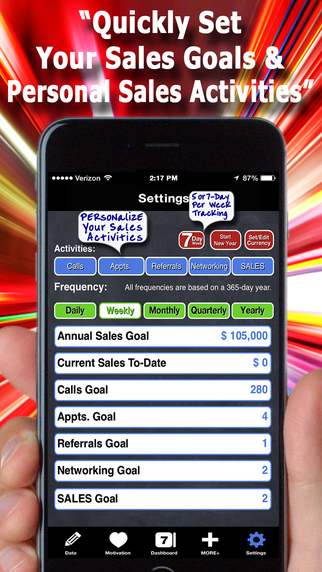 >>>> So here’s my offer: Download Sales Goal Tracker Pro Now … and test it against any CRM or other sales goal tracker. Then decide which is quicker. Which is simpler to use. Which you like better. Then, if you’re not 100% convinced that it’s one supreme sales goal tracking app, simply email me at support-iphone@callsonfire.com and I’ll personally pull out my wallet and give you a full and prompt refund. That way, trying my app costs your nothing. I can’t think of a fairer … more risk-free … way for you to discover how much faster and easier it can be to set, track and reach your sales goals. If you need or want a quick and accurate sales goal setting and tracking, then tap the download button now and you’ll never miss the CRM tools that drive you crazy. P.S. 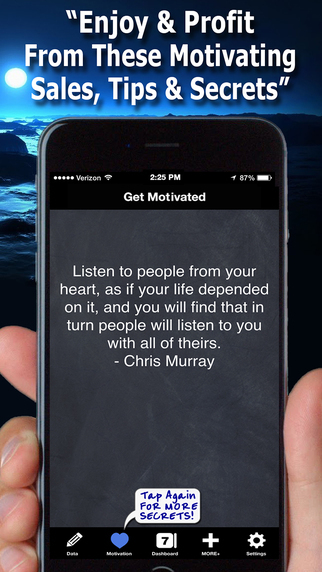 One More Thing: in the app… you’ll find 227+ hot sales tips, inspirational quotes and time-tested sales ideas to help motivate you to reach your sales goals. By the way, we're always excited to hear from you! PLEASE CONTACT US if you run into any problems using the app, have any feedback, up-date or feature ideas, questions or concerns you have to: support-iphone @ callsonfire.com. And please share Sales Goal Tracker Pro with your sales team and write a friendly review and * * * * * rating in the App Store.